Creating sustainable communities -- including the economic prosperity, environmental health and social equity aspects -- involves many challenges. In creating sustainable communities, planners collaborate to create solutions and implement policies that help lower consumption of natural resources, provide practical approaches to land use and reduce the overall impact on the environment. Planning involves many specializations such as: Community Activism/Empowerment; Community Development; Comprehensive/Long-Range Planning; Economic Development; Environmental/Natural Resources Planning; Food Systems Planning; Hazard Mitigation/Disaster Recovery Planning; Historic Preservation; Housing; Land Use & Code Enforcement; Parks & Recreation; Planning Management/Finance; Transportation Planning; and Urban Design. These specializations help lead to new sustainable solutions that can include green buildings and housing, mixed-use developments, walkability, greenways and open spaces and transportation options. Planners work to improve the welfare of people and their communities, shaping their urban areas and neighborhoods into healthier, more efficient spaces. Come learn more about the principles, processes and attributes of planners and how they work toward comprehensive plan standards for sustaining communities. We will explore the role of planners and creating sustainable communities in the context of equity and community capitalism to ensure that fairness and well-being are inclusive of all people in providing for housing, services, health, safety and the built environment. Visit OneSTL for more information. Originally from Virginia Beach, Virginia, Brian has been with Rise since 2003. He is the Technical Assistance Program Manager providing organizational capacity building and management, training along with housing development consulting services to nonprofit organizations, financial institutions and government partners. Additionally, he serves as a field instructor for Washington University’s George Warren Brown School of Social Work. He also supervises all of Rise’s interns. He has supervised and mentored nearly 30 practicum students and interns, helping to build capacity for the region’s community development system. It should be noted that he was a lead planner in the development of the Gravois Jefferson Historic Neighborhoods Plan which was adopted by the City of St. Louis back in May. He was the lead on the Youth and Education as well as the Employment and Business Development chapters of the plan. It is the first plan in the nation to use a racial equity lens in the development of a community-based plan. The plan recently won a St. Louis Section of the Missouri American Planning Association award because of its innovation for being privately-funded with grassroots support and due to its robust and inclusive community engagement. One recommendation of the plan has already been implemented because of Brian’s vision and leadership, which is the creation of Rise’s Young Neighborhood Leaders pilot program. The program received $20,000 to launch with funding support from Citi Bank and the Incarnate Word Foundation. The program involves 1) Employing young people of color, particularly blacks, in neighborhood-based organizations and businesses within the Gravois Jefferson planning area; (2) Supporting their opportunities for professional black mentorship; (3) Facilitating youth-led community development; and (4) Fostering a more diverse, representative generation of civic leaders and neighborhood champions. The achievements of planners and planning are celebrated in October with National Community Planning Month. The St. Louis Chapter of the American Planning Association encourages you to drop pins on the places that positively impact your community and make your community wonderful. Community Places Map will be available throughout the month of October in celebration of National Community Planning Month. Add a pin and a description of your favorite place on the Community Planning Map. Join us to talk about digital equity and how planning for broadband will create opportunities for all. We'll hear from speakers with experience visioning and planning for digital equity and broadband at the national, state, and local levels, using Missouri as a case study. Sponsored by the APA Technology Division. Please note this is not eligible for AICP CM credits but we hope you can join the conversation. 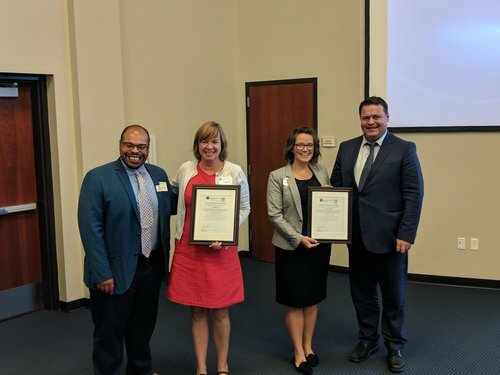 The St. Louis Metro Section of the American Planning Association is proud to announce the Community Planning Champion Awards will be awarded to Jacque Lumsden of CBB Transportation Engineers + Planners and Jenny Ryan of PGAV for their contributions to our communities. The Community Planning Champion Award may be awarded to recognize citizens and organizations who distinguish themselves through their leadership and exceptional efforts to advance their communities, places, and people. The Community Planning Champion Award honors persons who are making impactful contributions to their community through their actions, talents, and commitments. These persons have a deep passion for their cause and a proven ability to catalyze commitment into action. Only persons or organizations in the Greater Saint Louis Region are eligible. Establish significant and lasting impressions on land use and the built environment. Jacque and Jenny shall be recognized at the October 17th, 2018, professional APA luncheon on Wednesday, October 17, 2018, at the Maryland Heights Government Center located at 11911 Dorsett Road, Maryland Heights, MO 63043. Luncheon opens at 11:30 AM. Dreaming of an awesome and active riverfront for cycling, picnicking, dining, and living along the waters of the Mississippi River? The adventure of Saint Louis began at the Mississippi. 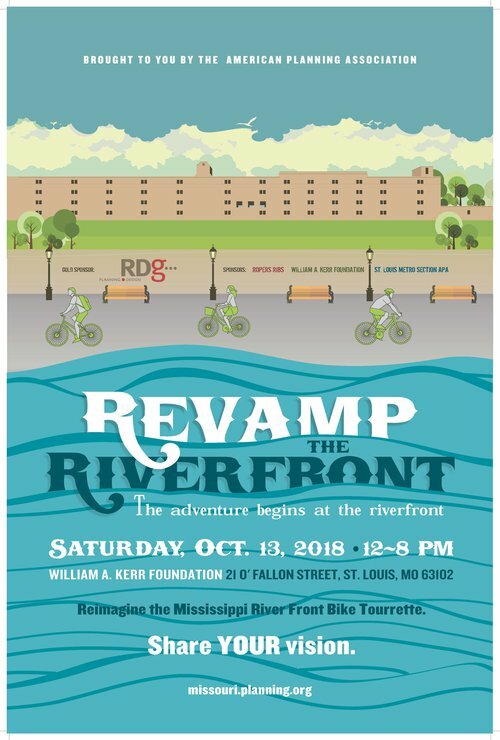 Revamp The Riverfront is a community event to reinvigorate our region's hidden gem, the Mississippi Riverfront. With your imagination, our waterfronts can transform into places that attract residents, businesses, tourist, and recreational activity. The charrette portion of Revamp The Riverfront will be held at the William A. Kerr Foundation located at 21 O'Fallon Street, St. Louis, MO 63102. Communities, from Quincy, Illinois, to Kimmswick, Missouri, are welcomed share their visions and plans of the Mississippi Riverfront. Explore the Mississippi Riverfront Trail, The Trestle, and more on our Revamp the Riverfront Bike Tours. The tour routes allow participants to brainstorm while exploring real conditions, opportunities, and constraints for developing around our riverfront areas. The bike tour will end at the William A. Kerr Foundation for the charrette and further discussion. Please bring a bike and wear a helmet. If you are in need of a bike, there are dockless bike available around Saint Louis. There will be an option for vehicles as well. Complementary food and drink will be available. On this six mile envisioning bike tour, riders shall see the elevated bike Trestle, pass by Produce Row, and shall stop at the Great Rivers Greenway Mary Meachum Freedom Crossing for a presentation overlooking the Mississippi River. Next riders shall travel along the Riverfront Trail to Rootwad Park and back to the William A. Kerr Foundation. Explore the Bike Route. Revamp The Riverfront needs awesome volunteers like you to help keep the Bike Tourrette riding smoothly. Sign up online to help facilitate a bike tour or charrette. Take a few moments to share your vision and ideas for a remarkable riverfront on the Revamp the Riverfront Form. APA St. Louis Metro Section article on KMOX. Read Now. The unofficial planning/community development/nonprofit/local government happy hour. Visit the Planning & Community Development Happy Hour Facebook Event for more information. Contact: John Cruz johnc@risestl.org for more detail.